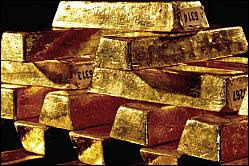 Goldnews reports that rush to buy gold fills Swiss bank vaults. "We have some room, but it's going to go quick," says a bank-vaulting source in Zurich to 20 Minuten Online in Switzerland today. Under the headline "No more room for Gold Bullion", the site says Zurich Kantonalbank recently had to move part of its silver holdings to external vaults to make way for more Gold Bullion, held as part of its fast-growing ETF offering. Investors looking to Buy Gold and store it in private, non-bank Swiss facilities using the BullionVault service grew their demand by 42% in the first half of 2009. "We're getting a lot of new enquiries at the moment," says 20 Minuten's banking source today. "It's first come, first served." The Swiss National Bank (SNB) confirmed today that it only holds state gold reserves in its vaults. Swiss clearing provider SIS Clear says it's only dealing with banking counterparties, and is also running out of secure vaulting space. 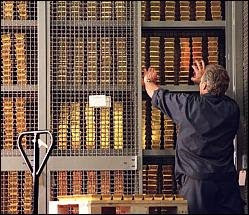 Zurich Kantonalbank reports that there are not enough safe storage locations for gold bars. The run on the precious metal, the banks problems: There are not enough safe storage locations. Gold is back in vogue: The fear of hyperinflation, an economic downturn and the success of the gold index funds has led to a run on the precious metal led. This is not only gratifying for the banks, which under the gold amongst the people. An investment banker Zurich on despair: "For our clients we also have more gold store, we find but little more suitable storage area." The retention of the gold makes high demands on security. But stability is required. A palette of gold, the knee-high with bars occupied, weighs several tons. A 12.5 kilogram ingot is not greater than a tetrapak milk. In Olten, the largest securities and gold bunker in Switzerland, he is SIX SIS managed services to the SIX Group. The speaker wants to request for security reasons, do not say where as much gold is stored and whether the vaults are filled or not. An employee who is not his name in the media wants to see, says over 20 minutes Online: "We still have space, but it will slowly close - we currently have many questions. Seen - Danish schn�ller, D� isch Gschwind. "Sisclear accept only supplies of partner banks opposite. In spring, the Zurich Cantonal Bank of space problems in the headlines. The Gold Index Fund, with the physical gold to be deposited, was so successful that the Zurich no longer knew where to put the bars. ZKB indicates that the problems are being solved: "The precious metal stocks in the ZKB stored largely in bank's own vaults. Only one part of the silver stock was in an external vault in Switzerland outsourced. The time could have capacity problems in the meantime, internal measures such as space-saving stacking technique, etc. are resolved. "ZKB media agency adds, would be the capacity of the bank's own vaults are no longer enough, so would the bank in Switzerland Drittverwahrstellen dodge. 1) Under the headline "No more room for Gold Bullion", the site says Zurich Kantonalbank recently had to move part of its silver holdings to external vaults to make way for more Gold Bullion, held as part of its fast-growing ETF offering. 2) Non-bank Swiss facilities using the BullionVault service grew their demand by 42% in the first half of 2009. 3) Swiss clearing provider SIS Clear says it's only dealing with banking counterparties, and is also running out of secure vaulting space. Conclusion: Why doesn't GLD ever have any storage issues? So, where is all this gold coming from? Where was it store before? Maybe in the central banks vaults? I would really like to see a proper audit. Where is the silver going? Could it now be leased out by the 3rd party storage people? Where is the silver going? GLD storage is in a file cabinet. This moving the silver out of the vaults thing sounds like a great way for someone to steal it. Thanks for the information, we will add this story to our blog, as we have an audience in the gold industry that loves reading like this. I admire writer that wrote remarkable articles that are really useful to the readers and bloggers like me for you teaches many lessons and provide endless useful information. Hope to read more from you guys and Thanks a lot for the post! I look forward for your next post.